Hopefully the photo works, Flickr on mobile is horrible. Looking to sell these - full working order, powerful sync properly and have been utterly reliable. 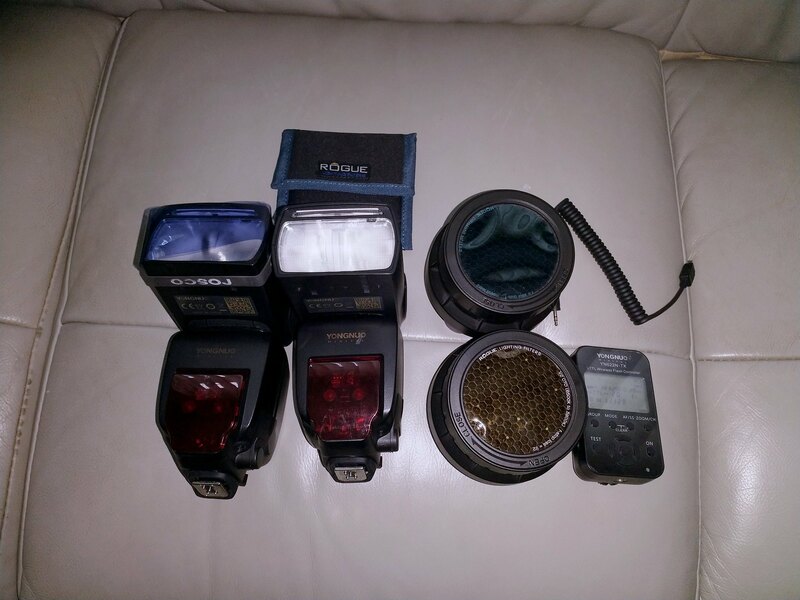 Fantastic quality flashes for a reasonable price. Controller works flawlessly and has a cable which does... Something? No idea, you don't need it. Also have a couple of grids that just about fit on and some gels that go in them. All of this for, say, £150 posted? The flashes are about 80 quid each new so hopefully that's a fair price for two plus a controller and accessories. Not having any experience of using a wireless flash system, would you need a second YN 622N unit if you wanted to use both flash guns off-camera? Or is it possible to set 1 gun as master & the second as a slave? The flashes can be used an an optical trigger - however, the trigger included in this can trigger both at the same time at different settings (manual or ttl, different exposure comp etc). Veery full featured. If you want one Flash on camera, you need to make sure the other has an optical line of sight. I mostly used the trigger with both off camera. Hope that helps! I feel more clarity is needed for someone without wireless flash experience .. These flashes have a built in radio receiver. This let's them sync, with TTL metering and HSS, up to 1/8000 of a second. However, they do not have a radio transmitter built in - the shoe mount transmitted does that. However, an on camera flash can sync optically with an external off camera flash. This works perfectly well, just slightly less convenient.. I've used these with a D7200 and they've worked flawlessly. True, but I feel weird about joining a forum just for classifieds... It's hitting ebay soon though.